The crypto crash that began two days ago accelerated yesterday and today, with essentially all top 100 coins down anywhere between 15-30 percent. The total market capitalization of all cryptocurrencies is hovering around $450 billion, down ~30 percent from $650 billion just 48 hours ago. Yesterday, Bitcoin was just a few dollars away from dropping below $10,000, but it bounced back around $11k, a 15% drop from two days before. But Bitcoin is now trading below $10,000 on most major exchanges right now. In the past 24 hours, ETH is down 22.5 percent to around $850, Ripple is down 26.3 percent to $1.03, and so on. Unlike some crashes where we see value flood from one cryptocurrency into another, this sell off was traders exiting into fiat. 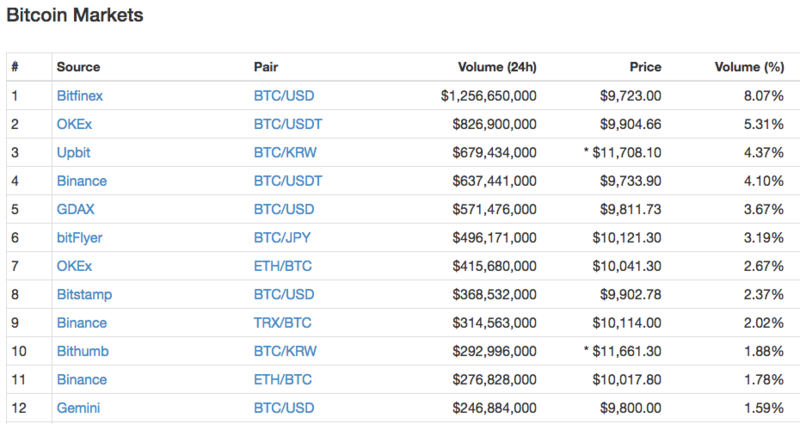 Interestingly, Tether is the sole token in the top 50 that’s not down over the past seven days, and that’s because the price typically rises slightly above $1 when there is a demand to “cash out” into the stabilized token. Per usual, there’s no real rhyme or reason to this selloff. Two days ago, we reported on rumors that some Asian countries were moving to regulate the cryptocurrency trading and mining industry, but there hasn’t really been any concrete news on this front yet. Regardless of the reasons some in the cryptocurrency community are happy that the market is seeing at least some degree of a correction, as it keeps realities in check and is generally better for the long-term prospects of the industry. Note: The authors own a small amount of cryptocurrency, including ETH and BTC.